For sequential deposition, the TF-SQC-310 features two sensor inputs, two source outputs and eight digital inputs/outputs, with an optional expansion card that doubles these numbers. 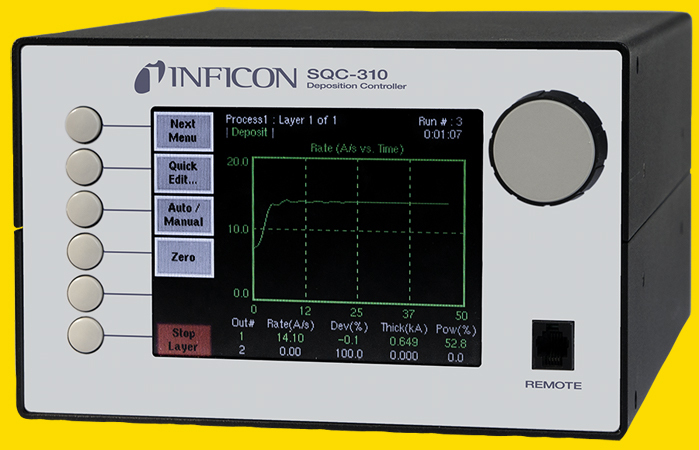 For co-deposition, the TF-SQC-310C controller monitors up to four quartz crystal sensors with four PID control outputs, 16 digital inputs and 16 relay outputs to the same specs as the TF-SQC310. • Standard RS232 and USB (RS232 & ethernet option). • Windows® program for developing, testing, and downloading processes and for logging instrument data to your PC for process analysis and quality control. • Accurate process control, especially for low deposition rates, with ±0.03Hz resolution at 10 readings/second. • Storage capacity for up to 100 processes, 1000 layers,50 films. • Monitoring of source material with a single sensor or with multiple sensors to provide accurate source distribution monitoring. Relays : SPST from 1A, 30V, 2A max.